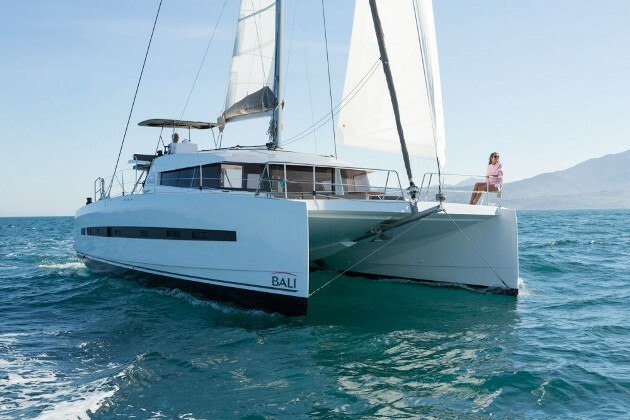 Speed and safety continue as hallmarks of this sleek and revamped 25 knot catamaran from a respected French builder. The US debut of the Catana 47 was the 2012 Miami boat show, and this lighter, faster, fully updated model is the next generation of her predecessor, the Catana 471. This boat should have no trouble appealing to safety-minded bluewater cruisers who are looking for fast and easy passage-making. 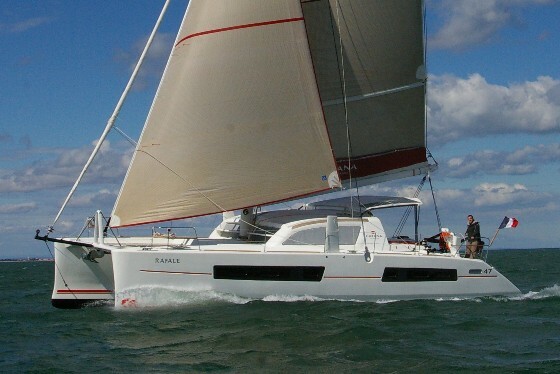 In the right breeze, the Catana 47 can hit 25-knots. A trait all Catanas share is twin helms – one on each hull. This doubling-up of systems is good for redundancy in case of failure, but it does leave the helmsman out in the elements when hand-steering. For some that has been a deal-breaker, but most existing Catana owners trust in their autopilot and say they never hand steer except when docking. With the helms outside, the cockpit, which is protected by a hardtop, is dedicated to entertainment and lounging. It’s an ideal place to congregate and the sliding door seamlessly connects the interior with the exterior. The new model is 1500 pounds lighter due mostly to the use of Twaron in the infused sandwich construction. 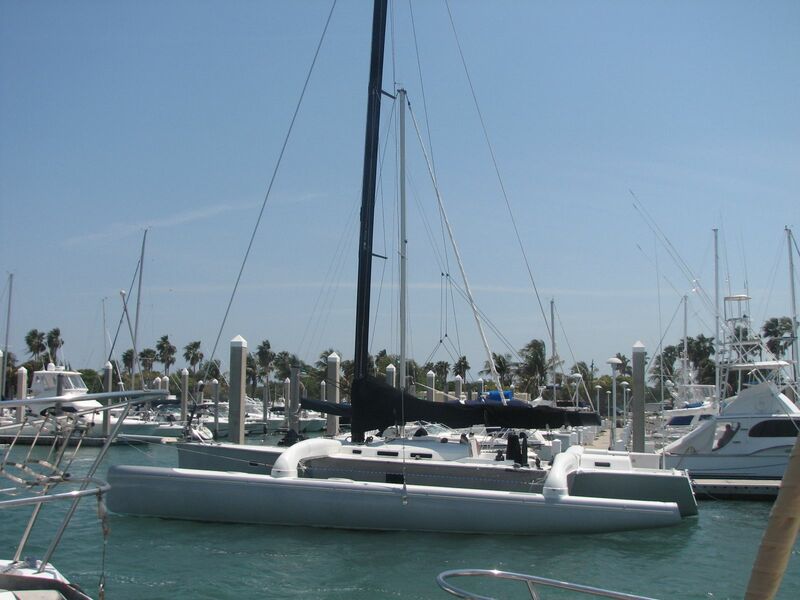 Twaron is an engineered fiber that is stronger than steel but half the weight of fiberglass so it’s ideal in the construction of weight-sensitive catamarans. The Catana’s slimmed-down weight means she can sail faster, and with her two deep daggerboards, she’ll point well upwind. The interior of the Catana 47 is by Linea Concepts and takes the accommodations a step above the basic utilitarian surfaces of production catamarans – as it should, since Catana’s positioning is as a semi-production luxury builder. The standard layout of the 47 includes a bright saloon with an L-shaped galley to port that has a three-burner stove, twin sinks, and a sliding window that’s handy for passing food to the cockpit. A front-opening fridge is to starboard next to the entryway. I was glad to see a full nav station, a feature that’s fast disappearing in production cats these days but is something that will be appreciated by long-distance cruisers. This nav station provides a dedicated interior space for electronics (choice of Simrad or Garmin), charts, and a workspace, even if much of the navigation these days is digital. 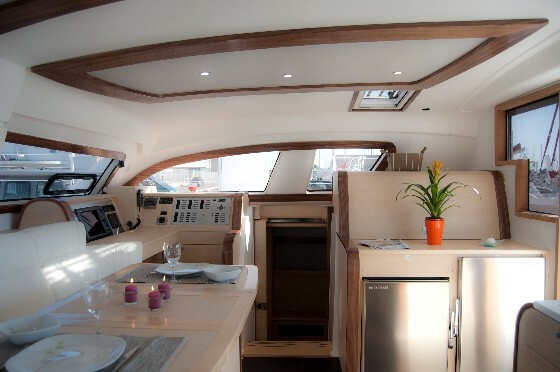 Although this catamaran puts its priorities on speed and safety, the interior is all about luxury. The panoramic windows and liberal use of light wood and white upholstery make the saloon bright and inviting. In the three cabin version, the owner’s stateroom is to starboard and five steps down behind a roller door. For long range cruisers, a smart idea here is the separate desk which keeps the clutter off the dedicated nav station but still provides an area to attend to ship’s business. Forward in the owner’s hull is a well-sized bath with an electric head and a separate stall shower behind a glass door. Aft is an ample bed with a foam mattress and plenty of stowage. Twin guest cabins are in the port hull. The forward cabin has a full-sized berth and the aft cabin has twins separated by a narrow table. Each cabin has a head and shower combination; it seemed to me that for a cruising couple without a full boat of guests, one of these heads would make a great wet locker. A lighter boat can carry more stuff before the weight becomes dangerous or detracts from performance. 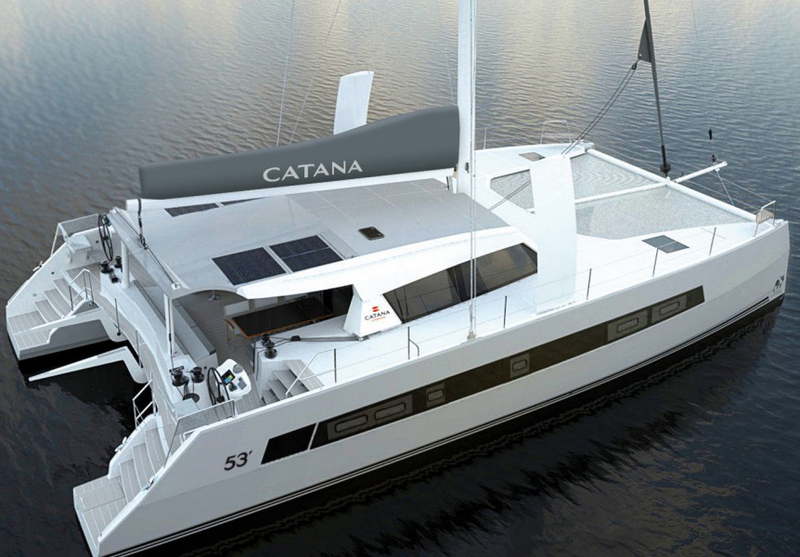 That’s good news for the Catana 47, which has almost 180 gallons of water and 160 gallons of fuel; it can go farther and let cruisers be self-sustaining longer. But it’s the performance that sets a Catana apart. According to the builder, on her initial sea trials the 47 reached 25 knots. She is expected to do 20 knots regularly. Her deep retractable keels help her point higher when sailing upwind. 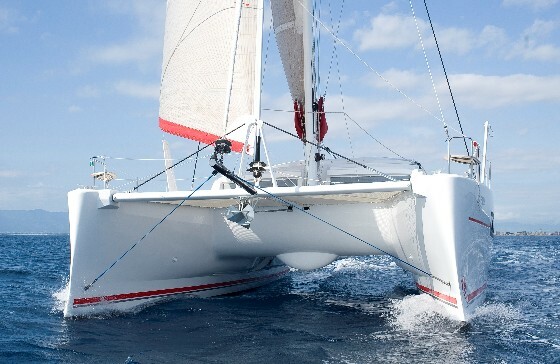 More importantly, because the Catana’s keels can be pulled completely up into the hull, there are no fixed obstacles below the waterline for the boat to trip over in case she gets sideways in a large and messy sea. That means less chance of capsizing, which is every catamaran’s worst-case scenario. Sleek hulls minimize interior volume, but that is the price you pay for speed and efficiency. It’s almost a rule that performance and comfort are opposing forces and for sailboats, it’s often the case that sleeker models are optimized for speed rather than interior volume. 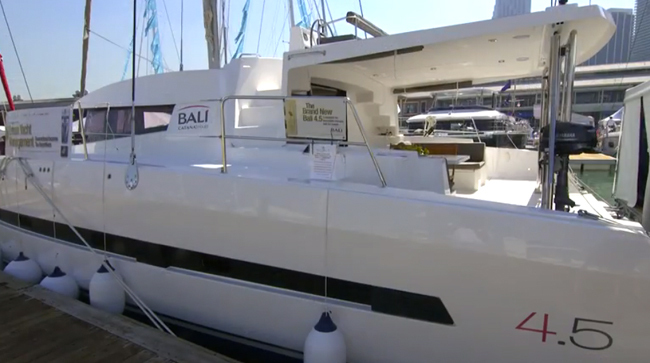 The Catana 47 suffers the same fate. 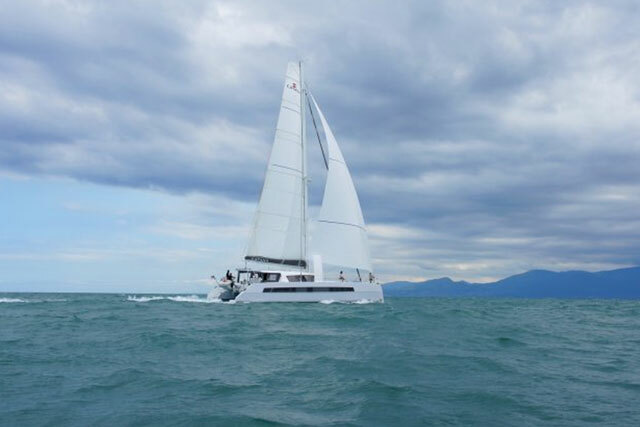 If you compare the profile of a classic catamaran designed for large charter groups with that of the Catana, you’ll see that the charter boat’s house is longer fore and aft. That increases the interior significantly, providing more living space and the feel of a larger boat. 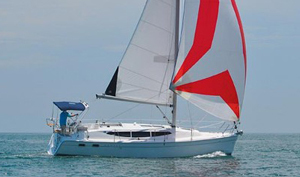 The Catana 47 is definitely more compact than other boats of her length, which may be a squeeze for chartering, but it’s plenty for a cruising couple with a child or two. 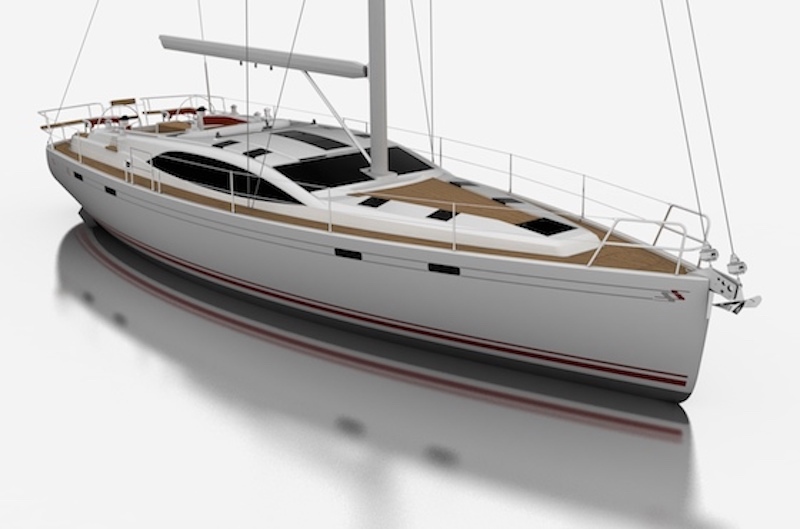 The Lagoon 440 is the same length, but it’s almost the Catana’s antithesis. The Lagoon is big and bulky and perfect for vacationing, less so for crossing oceans swiftly. A closer comparison may be the Leopard 44, also large and well-laid out for comfortable cruising, but a bit more oriented toward reeling off the miles under sail. 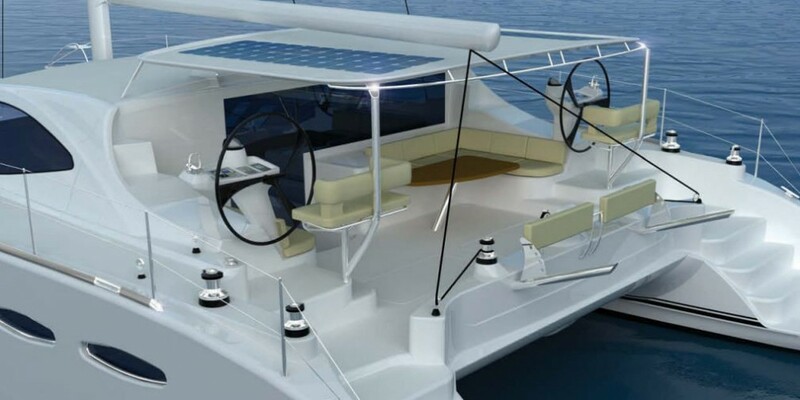 The Catana 47 is powered by twin 40 HP Volvo diesels with Saildrives in engine rooms that can accommodate an optional genset and/or watermaker. The base price is $750,000, FOB the factory in France. Electronics, commissioning, a genset, and additional cruising and safety gear will add several thousand more. This is not an insignificant investment, but if you’re set on bluewater cruising aboard a catamaran, what price can you put on speed and safety? For more information, visit Catana.